Click here to the MSRC Central Database to create an account. This will allow you to register for the courses required and receive notifications. Click here to go to Course Schedule for a list of all active courses will be displayed, choose any Grade 8 Entry Level Course. You can do an advance search on the top right hand corner by entering the type of course and your zip code. Once you have found a course you wish to take from Course Schedule, and are logged in to MSRC Central, all you need to do is click the “Enroll” button, confirm your registration, and pay the course fee either with a credit card or by mailing a check to the name and address on the enrollment information. You will receive confirmation by e-mail from the MSRC and the course you have selected will appear on your personal page when you log into MSRC Central. If unforeseen circumstances require you to drop or change courses, you can do so from within MSRC Central. See the Course Cancellation and Refund Policy. On the day of the course, plan to arrive at least 30 minutes before the scheduled time. There is a lot of material to cover and the instructor will allow breaks between each of the modules. Bring paper and pen or pencil. If it is an all day session, bring your lunch and a snack. In the event of inclement weather or other unforeseen event causing the course to be rescheduled or delayed, you will be notified by email. 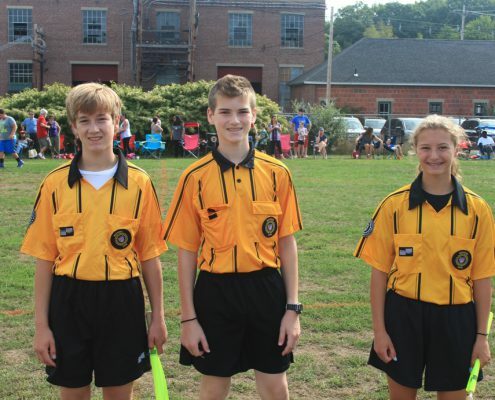 After passing the written test and attending the class you will need to buy the basic uniform for referees: a yellow shirt, black referee shorts, black socks with three stripes and black cleats/sneakers. Though there are several places to buy uniforms, USSF is officially sponsored by Official Sports Inc. and they offer starter kits. Additionally you will need a wrist stop watch (not your smartphone), a Casio or Timex work best. You’ll need a loud whistle, a coin, red and yellow cards and a set of flags. The starter kit on Official Sports will have all but the watch and coin. What to expect on your First Year as a referee? Referee Grade 1/2 games (6 and 7 year olds) on Saturday mornings. Assist Referee and Referee Grade 3/4 games (8 and 9 year olds) on Saturday mornings. Every year you will be required to take a re-certification test by attending a 5 hour class. CONGRATULATIONS YOU ARE NOW A USSF REFEREE!